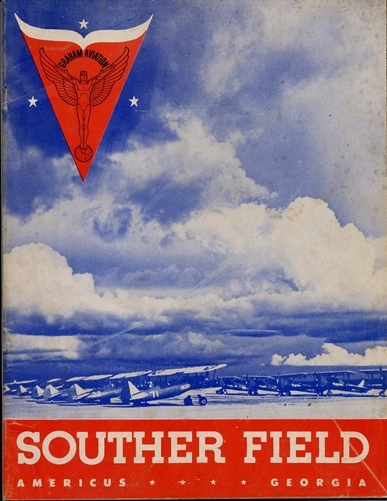 "A quarter of a century has rolled by since Souther Field was first the sight of plane training. Now, cadets of the two greatest nations on earth are there, learning the art of dealing death from the air to any foe seeking to enslave either of the democracies. "Many of these temporary guests, from far and near, would know how and why and where the field got its name. Several local citizens were asked and the library and Chamber of Commerce were interrogated, but there was no available record here. Major Henry Souther, U.S.R., son of Henry and Mary (Wheeler) Souther, was born in Boston, Massachusetts, on September 11, 1865. After graduating from the Massachusetts Institute of Technology and engaging in graduate studies at metallurgical schools in Germany, he was employed at the works of the Pennsylvania Steel Company, at Steelton, Pa. Later he was identified closely with large bicycle production, in metallurgical and general consulting capacity. From this field he went to the automobile industry, taking with him much valuable engineering data, including the results of tests of pneumatic tires of the fabric and of the cord types. He was for some time State Chemist of Connecticut. He conducted for many years at Hartford a chemical and physical testing laboratory. The laboratory was used in much pioneering automobile engineering work. 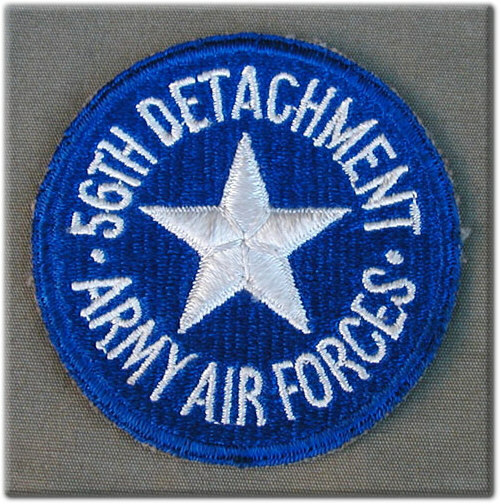 At the outbreak of the World War, Major Souther became deeply interested in the preparedness movements in this country. Early in 1916 he assumed duties with the Government, making intensive investigations in the airplane field, with regard particularly to engines. According to an eulogistic article by Mr. Coker F. Clarkson in the Journal of the Society of Automotive Engineers in August 1917, Major Souther's work while associated with the Aviation Section of the Signal Corps, first as consulting engineer and later as major, United States Officers' Reserve Corps, was fundamental in character. From the very outset his foresight and imagination led to a conception of the vastness of the problem and to the evolution of an organization to cope with the work. He died at Fortress Monroe, Virginia, Hospital on August 15, not surviving an operation resulting from an acute development of a recurrent malady. It was believed by some that the assiduity with which he applied himself in the Government service overtaxed his physical strength. Sources: (1) Clarkson, Coker F. - A Pioneer in Standardization. In the Journal of the Society of Automotive Engineers, Vol. I, No. 2, p. 129-131, August, 1917. (2) Who's Who in America, 1916-17. (3) New York Times, Aug. 16, 1917, p. 11, c. 7 (C.A. Quattlebaum, August 16, 1941). The item above was submitted by Alan Anderson. Thanks to Jim Plante & John E Campbell for the image of the emblem above. Thanks to Jeff Quirin for the image of the emblem above. 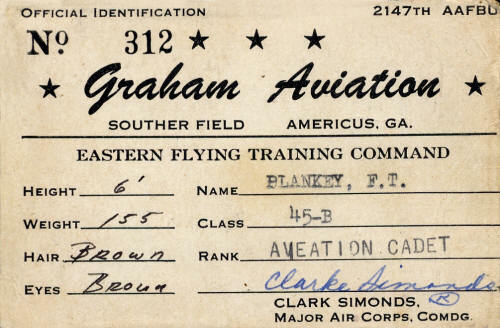 Click above for images & text from a Graham Aviation....2147th Army Air Forces Base Unit Souther Field Americus, Georgia. 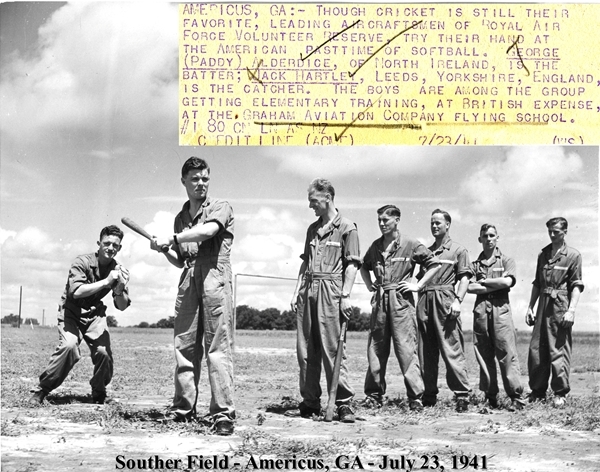 Included are photos and names of many who served at Souther Field during WWII. lick above for images & text from a Graham Aviation....Army Air Forces Base Unit Souther Field Americus, Georgia. 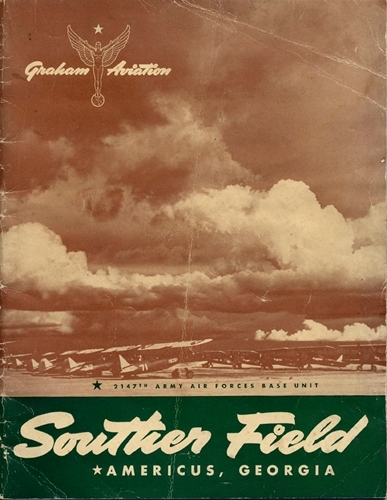 Included are photos and names of many who served at Souther Field during WWII including CLASS 44E. Royal Air Force Cadets trying their hands at American softball. The batter is George (Paddy) Alderdice of North Ireland and Jack Hartley, Leeds, Yorkshire, England is the catcher.